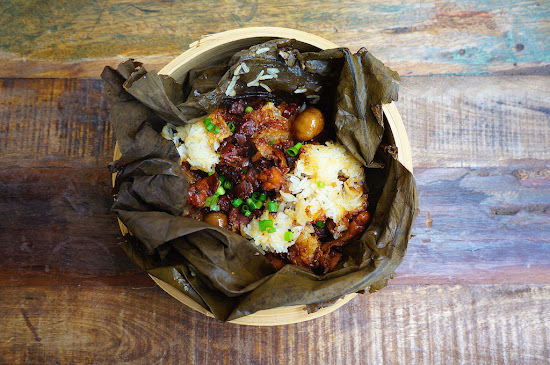 Steamed Glutinous Rice In Lotus Leaf tastes delicious at any time of the day, make sure to serve it piping hot. ~soaked in boiling water for about an hour. Rinsed well and dry with paper towel. Marinate the chicken for about 3 to 4 hours or overnight in the fridge. When ready to cook, steam the glutinous rice on high heat for about 30 minutes. Meanwhile, heat the oil over medium heat and fry shallots until golden in color. Then mix in the garlic and dried shrimps and stir-fry until fragrant. Turn the heat on high and mix in the lap cheong, mushrooms, chestnut and stir well. Then add the marinated chicken and cook for about 3 to 4 minutes. Then mix in the sauce and let it simmer for about 2 to 3 minutes or until the sauce has thicken. Remove from the heat and set aside. When the rice is cooked, remove and set aside. 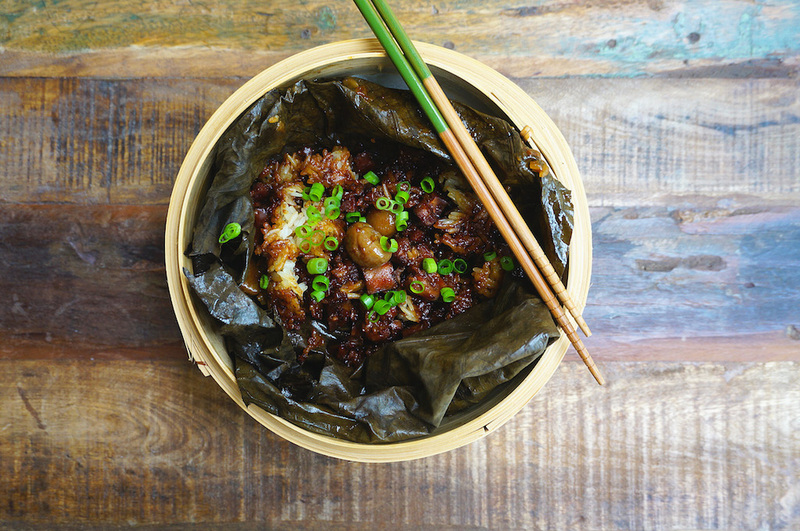 To wrap the rice: Place a piece of lotus leaf on a flat surface, scoop some steamed rice and spread it slightly. Spoon some of the chicken meat filling on top of the rice. Then scoop some steamed rice and place it on top of the meat filling. Wrap the rice tightly and place it in a steamer. Continue the process with the remainder rice and chicken. You can also combine the rice and the chicken meat filling together and simply scoop some of the mixture onto the lotus leaf and wrap in the same manner. Transfer the wrapped rice into a large steamer and steam on high heat for about 40 minutes. Serve with some chopped scallion and chill sauce.